At First Church, we believe that every person matters. To that end, we have established ministries and outreach missions designed to spread the word of God and help people locally, nationally, and globally. Several of our local missions take place on site at First Church, primarily to serve those in need in our local community. Each Tuesday and Thursday morning from 10:00 to 11:00 in our Fellowship Hall, we provide lunch so that those in need can enjoy a prepared meal and join us in fellowship and friendship. Our Food Bank is located in our Uptown Ministry Center and is open on the third Saturday morning of each month from 9:00 to 11:00. Those in need in our community can visit the Food Bank for boxes of food they can take home and enjoy. For those who may have a more immediate need, we also have Karen's Pantry, which can accommodate people on an as-needed basis by providing a bag of food sufficient for a few meals to anyone who comes to the Church Office. Our Clothes Closet offers clothing and some limited household items and is run in conjunction with our Food Bank. The Clothes Closet is also located in our Uptown Ministry Center and is open at the same time, third Saturday of each month, as the Food Bank, and at other times as may be necessary by appointment. In addition to the services and ministries we operate at the church, we also provide prayer and support for local agencies, organizations, and schools. At the beginning of the school year, we provide school supplies to Albert Harris Elementary School to assist students in need. During the Thanksgiving, Christmas, and Easter breaks from school, we provide food bags to Albert Harris, Patrick Henry, and Campbell Court in order to supplement the children's meals at home when they would not otherwise be provided with a school lunch. The Good News Club is an after school ministry which brings a VBS-style class to children in the local schools for one hour a week for six weeks each spring and fall. First Church volunteers lead The Good News Club at Axton Elementary School in Henry County to bring the word of God to students through games, music, and other entertaining activities. 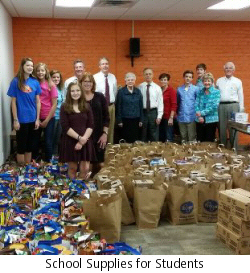 The Evangelism Team at First Church delivers food and other goodies to local schools and service agencies on the second Wednesday of each month. These monthly deliveries are an expression of our gratitude and support for the work they do. Related to the food and other goodies described above, the Evangelism team has a monthly Prayer Walk to our local neighbors on the first Wednesday of each month. We have visited Piedmont Community Services, the Martinsville library, the police and sheriff departments, the City Municipal Building, and the United Way to name a few. First United Methodist Church has been a Stephen Ministry Congregation since 2010. Stephen Ministry is a one-to-one lay caring ministry. Stephen Ministry congregations equip and empower lay caregivers - called Stephen Ministers - to provide high-quality, confidential, Christ-centered care to people who are hurting. While much of what we do at First Church focuses on the many needs of our local community, we also have mission and ministry work reaching outside of our area into other parts of the nation and around the world. Each year, our Youth Group undertakes a mission trip, raising their own funds and working toward the goal of traveling to other parts of the country for mission work. To learn more about their projects, please visit our Youth Ministries page. 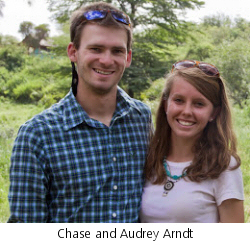 Through The Antioch Partners, we sponsor Chase and Audrey Arndt, our missionaries to the Maasai tribe in Kenya. The Arndts have been busy with the many projects they have developed in the village of Loitaktok in the foothills of Mount Kilimanjaro in southern Kenya. Teaching through Chronological Bible Storying, the Arndts have ministered to a girls' school in Loitaktok. This oral tradition of storytelling is helpful in teaching the Word of God in ways that help their students process it in newer and deeper ways. Their mission work has been so effective that they have now extended it to a class of 25 pastors. To follow the Arndts in their mission work, please visit their blog, Into Africa.